Spacious four bedroom home in the heart of the Fairview neighborhood. As you walk into the main level living room you can enjoy yourself on the plush couch by the gas fireplace built in stone surrounding. Huge windows not only offer plenty of natural light but also gorgeous mountain views. The living room space is adjacent to the dining area and the kitchen. Nice dining table that seats 8 people with additional space for two at a kitchen counter top. You will enjoy pale wood decor and the granite tops with plenty of preparation space and new appliances. Step outside to enjoy the deck with additional seating area and gas grill for cook outs which is overlooking beautiful mountain scenery. The king master suite features flat screen tv and beautiful mountain views. The spacious bathrooms has double vanity sink, jetted tub and walk in shower. Downstairs after dinner, unwind in the main living room space with huge flat screen tv and selection of DVDs. 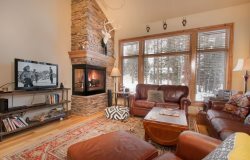 Turn on the gas fireplace to make yourself, your family and friends very warm and cozy after the day on the mountain. Walking to the right you will find another king master suite with single sink and walk in shower. There is additional space around the corner with a sofa chair facing the windows. At the lower level you will also find additional two bedrooms Another king bed and a second large room with one queen bed and two singles. This rooms also features additional sink in the corner. Share one bathroom between those two bedrooms with single sink and the shower with a tub. All bedrooms features flat screen TV's. Additional features include a double garage, additional driveway parking, in-house laundry facilities, and mud room perfect for keeping your skiing/Snowboarding equipment and boots. Attached garage for 2 cars and private driveway. Communication was excellent. Any questions I had during my stay were promptly addressed. Lots of space for our party of 10. Layout of the kitchen, dining and living rooms is very open making it easy for a group to prepare a meal and cleanup together. The beds were too firm for me, but I realize some people prefer them that way. Overall, beautiful home and nice location. Family room on lower level with big screen tv was nice for those who wanted to watch movies. Beautiful home very well appointed. Well set up with everything you could want or need. Vacation of a lifetime. Breckenridge is a fantastic resort for the perfect ski holiday and this property really was the icing on the cake. The rooms are all spacious and the two living room areas (1 upstairs, 1 downstairs) gave everybody the space to do their own thing. The location is perfect. A free-to-ride bus stops a 2 minute walk from the front door and takes no more than about 5-6 minutes to get to the gondola station and the town. Kitchen facilities are superb and the ski boot room kept the house uncluttered. The beds are huge and very comfortable and the bedrooms are more than spacious. The house is on the Dillon side of Breckenridge which means access to all the bigger stores and outlets is only minutes away, whilst the Main Street, Breckenridge is only minutes in the other direction. The house is set in a peaceful cul-de-sac and is well furnished for every need. I can't recommend this property enough for your next ski trip or even your next summertime mountain adventure. I hope I can get the family back soon to experience the area when the snow has gone to see it in a different light. Wonderful Home in Breckenridge! We had a great experience renting this home in Breckenridge over Thanksgiving week! The house is very spacious, with a great layout, especially for families or groups. There are two huge "hang-out" spaces - one upstairs and one downstairs. We rented the house with another family, and the kids were able to hang out downstairs and watch movies, play games, etc, while the adults could relax upstairs by the nice warm fire. We really liked the location, as it's just outside of Breckenridge, towards Frisco, where we found the best Grocery Shopping (Whole Foods, etc). The shuttle to take you to the mountain (which is just a few minutes away) picks up right next door to this house, so it's incredibly convenient. House has all amenities you would expect. We will definitely be back! Very clean, comfortable and has more than what you'd ever need for a relaxing stay in a scenic residence just a short 5 min drive from the Breckenridge ski resort and Main Street downtown area. We loved coming back after a full day on the slopes to a luxurious pad with heated floors, comfy sofas and full entertainment center. Big kitchen with any appliance you'd need to make dinner for a large group. Chest full of board games was a plus for our group of 11. Beds were great and jacuzzi bath was a gem. Bring a good book, take in the sights from the living room window and let your worries melt away. We'll be back! Everything we could have wished for. Beautiful home, well taken care of and every need catered for. We cooked a huge meal for over 10 people and the kitchen had multiples of everything - meant my husband barely had any washing up until the end! Bedrooms are all brilliant is size and great for families with children. Also great having multiple bathrooms. The proximity to the bus stop is brilliant - easy walk with toddler and regular shuttles to town (where parking was tough sometimes, so we were glad for the bus). Lots to do with kids within easy reach of the house - sledging, childrens museum and paint your own pottery type place. Would highly recommend to anyone! Will be lovely to make a return trip in the summer. Thank you!! Perfect Location. We were a bit nervous booking a place not in the city centre of Breckenridge. Having stayed here I would never want to book in town. The shuttle to the sloops is a 3 minute walk from the front door. Using that service we never worried about parking and we used it both to ski and to go into town to shop and dine. The property itself is new and clean. We stayed with about 9 other people and it never felt cramped or even full. Everyone had their own space and privacy yet the kitchen, dining and lounge areas accommodated us all comfortably when we did gather as a group. This is a property that is perfect for groups yet priced for couples. We look forward to staying here again. Awesome stay in Breck! Our family just returned from a wonderful trip to Breck and want to let you know we LOVED your house! It was perfect for us. The location is PERFECT...it's less than 5 minutes to the gondola by car but we also used the bus is was easy/free. We had 2 families with us and the kids really enjoyed having their own "hang out" room downstairs while the parents stayed upstairs. The house is really comfortable and the kitchen was fully stocked which made preparing meals easy. My wife and I had the master downstairs which was lovely. We're looking forward to returning soon! Everything you could have wanted for the perfect fall getaway weekend. A great house in a great location with everything you could want. It was fully equipped with not only everything you needed to cook for a group but also to be fully entertained with TV's, movies, games and books for your pleasure. There was plenty of space and multiple bathrooms so getting ready was made easy. In a good location for exploring the area with a Whole Foods and restaurant options near by. Definitely a place I would stay again!!!! !